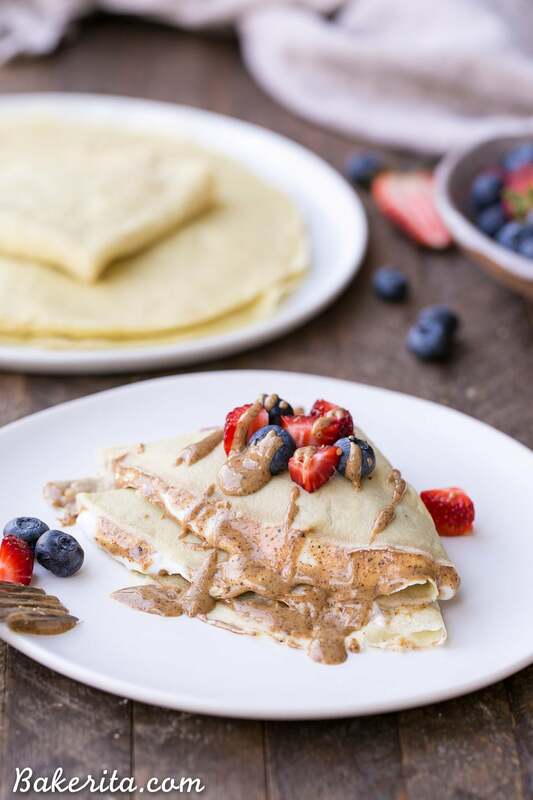 I had some other post on the docket to be published today, but after I posted these paleo crepes on my Instagram story last week, you guys went nuts for them. SO many of you were messaging me telling me you were searching my site for the recipe and couldn’t find it. Well, that’s cause I hadn’t posted it yet so after quite a few recipe requests, I moved these paleo crepes to the front of the line so you guys could enjoy them ASAP. These crepes originally came as a request from the dental assistant who always takes care of me when I go in for my Invisalign appointments. She’s the sweetest, as are all the people who help me there, and they always ask about the site and the things I’ve recently made when I go in. So, when she suggested I come up with a healthier crepe recipe that can be used for both sweet and savory fillings, I was all about it. It immediately went onto my to-do list, and as soon as I got around to making them, I wondered why I didn’t do this years ago. Crepes have always been a favorite of mine, and when I studied abroad in London and traveled constantly around Europe, I ate a LOT of crepes. I remember have a ridiculously delicious ham & cheese one in Copenhagen, and one dripping with Nutella underneath the Eiffel Tower. Crepes bring back lots of delicious memories. Now that I can make them, gluten-free, refined sugar-free, and Paleo-friendly, in my apartment, crepes are going to be on the menu a whole lot more. Especially because of how darn easy they are to whip up! 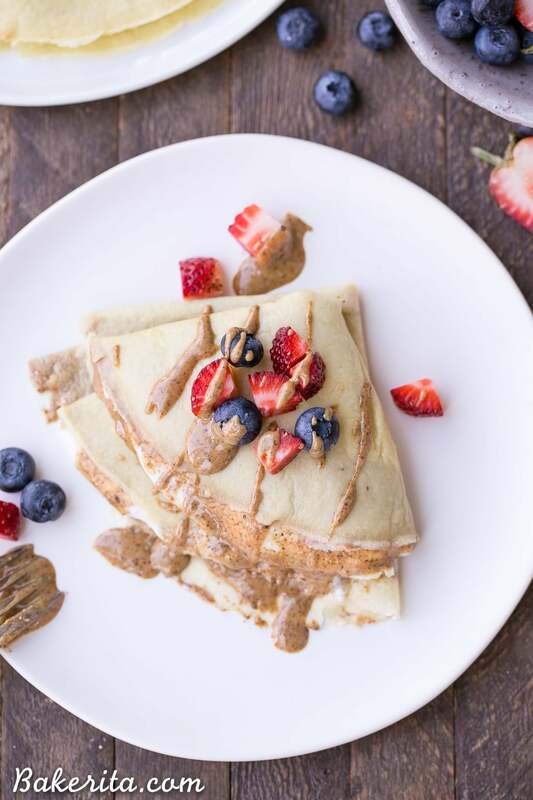 The paleo crepe batter is made in the blender – just combine all the of the ingredients and blend to combine. 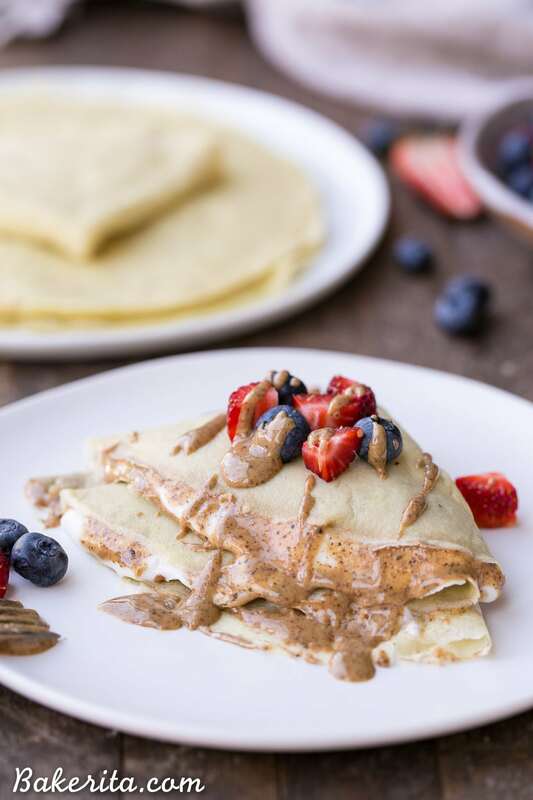 The ingredients are simple, with optional vanilla and coconut sugar add-ins if you want a sweet crepe. Once combined, put it in the fridge for 10-ish minutes to let the flours absorbed. While that happens, heat up your non-stick skillet. 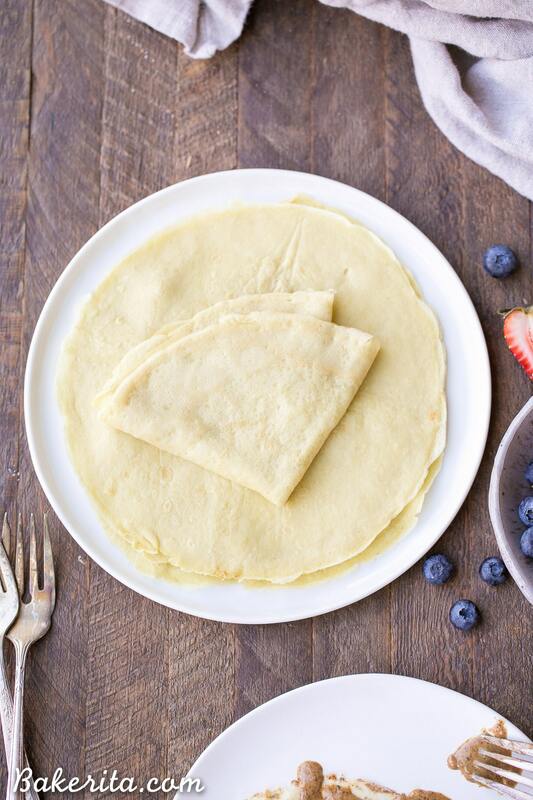 Once your pan is hot and your batter is chilled, make your crepes! Just pour on some batter, swirl it around in your pan to thin it out, and flip it over carefully with a thin spatula when it cooked through. It will only need about 30 seconds on the other side to cook. Repeat with all your batter, and serve! If you only want to make a few crepes, you can also save the extra batter for another day. 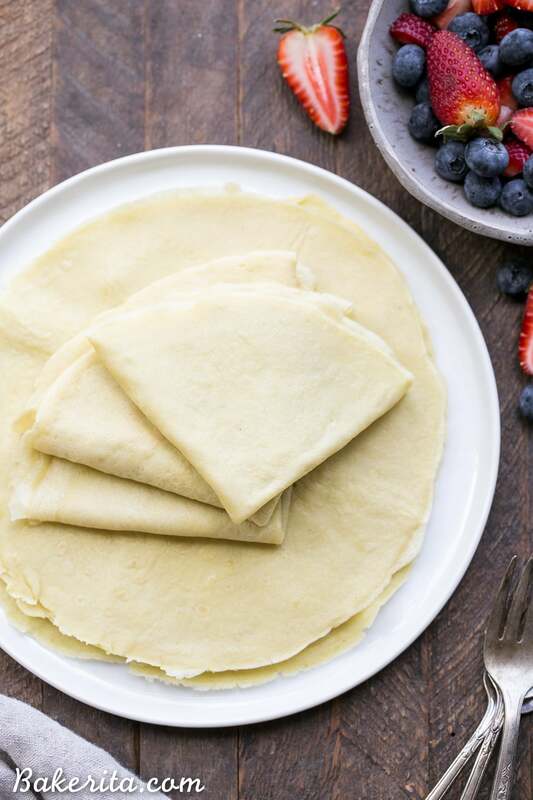 Once your crepes are done, roll or fold them up with whatever sweet or savory fillings your heart desires. I went with almond butter, coconut yogurt, and berries for mine, and some of the leftover crepes went savory with chicken, pesto, and baby kale. So good! Use your imagination for your fillings. The options are pretty endless…I’m even dreaming up crepe cakes made from a big stack of these :) you’re going to love this easy recipe! Enjoy. In a blender, combine all of the ingredients and blend until completely smooth and combined. Refrigerate for 10-15 minutes to let the flours absorb. Heat a medium or large non-stick pan over low-medium heat - I used a 10” pan. If your pan isn’t super non-stick, add a little dollop of coconut oil. Pour the batter onto the griddle, using approximately 1/4 cup for each crepe. Tilt the pan with a circular motion so that the batter coats the surface evenly. Cook the crepe until set, 1-2 minutes, until the bottom is light brown. Loosen with a spatula, turn and cook the other side until cooked through, about 15-30 seconds. Repeat until all batter is used (or keep extra batter covered in the fridge for another day). Serve hot with desired fillings. These crepes look fanatic, Rachel! I’ve never attempted to make them before, but I love how easy they are. And so fun to customize, too! I love your suggestion of using almond butter…mmm! I’m totally craving a big stack of these for breakfast today! Testing this recipe was the first time I had made them too! They’re SO easy and so delicious. Thanks Gayle! I’ve been meaning to try making crepes for the longest time and just never seem to get around to it! These sound and look fantastic!! I’ve never made crepes and I have no idea why??? Now I have an excuse to try with this easy recipe. Looks delicious! Thanks Megan – you’ll love them!!! I love a good crepe and agree that ones dripping with nutella are my fondest memories of going abroad! OMG I see a crepe and mimosa in the near future (aka this weekend). Ps: making your paleo choc chunks tomorrow! Yes that sounds like a perfect pairing!! Hope you love the chocolate chunks :) thanks Lindsay! You are a freaking magician. I cannot believe that these amazing, flawless, crepes are made with THOSE ingredients. so cool! These look incredible! You mentioned using a thin spatula; what brand do you use? I am not sure if my Farberware’s are thin enough to flip crepes. I use a thin metal off-set spatula – not sure of the brand because I got it at a restaurant supply store, but any pretty thin spatula should do the trick! 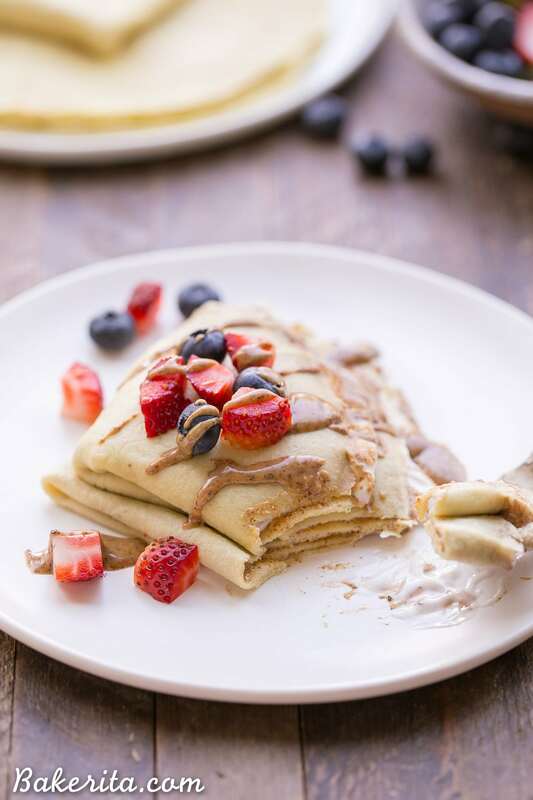 Yes please, a stack of these crepes is exactly what my weekend needs! We just got done eating these for breakfast. I had to cut my two toddlers off at two a piece filled with your amazing banana bread nut butter – they LOVED them! And I had one with egg, spinach, and tomato and it was delicious! This is a much better crepe recipe than others I have tried so thank you like always Rachel for a great recipe! How odd, Ashby – are you sure that they were spread thin enough and allowed to cook for long enough before you tried to flip them? They should be pretty much cooked through by the time you’re ready to flip. I have made this recipe a few times now and absolutely love it! The only time I had a problem was when I put it in the fridge to set for 10 mins as suggested, other times I just whip it up in a jug with a whisk and leave it on the bench while I cut fruit up, the coconut oil went all lumpy when chilled and I think that was the problem, I won’t try another recipe that’s how much I love this!!! thank you! Thanks so much for your feedback, Dee! So glad you’re loving the crepes! My son loves crepes. He has a sensitivity disorder and is very fussy about what he will eat. He said he likes these better than regular crepes. He said, “They are like crepes but with more flavor” . We made coconut cream whipped cream and cooked strawberries and blueberries with applesauce for the filling. Your crepes are amazing! I am from France and I don’t miss the regular kind even a second! I am currently in France visiting my family and I wanted to make some for them but I realized I mistakenly brought tapioca flour instead of adoration flour. Have you tried it with tapioca? When I Google it, it seems to be fine. Hi Martha, what a compliment!! So thrilled to hear you’re loving them – extra flattering considering you’re from France! Tapioca flour should be just fine here :) enjoy! Crapes are one of the staples for weekend breakfast in this house. I have tried many variations of gluten free and then grain free due to my wife’s sensitivities. Until now I have not found a perfect substitute. This is awesome, they cook with the same consistency of “normal” crapes and don’t fall apart like most gluten free foods. I did alter a bit due to what I had, used coconut cream instead of almond milk, therefore left out the coconut oil. Filled with Coconut yogurt and topped with peaches gave my wife a great breakfast!! Sounds so delicious!! So thrilled you and your wife enjoyed these, Bryan. Thanks so much for the feedback.